# DR4402HD3 Super Heavy Duty Bridge Rectifier with 80 Amp Diodes and Dual Copper Heat sinks. 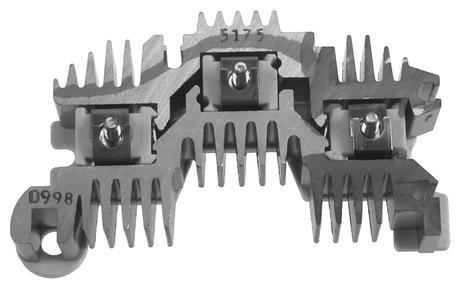 MAY BE USED IN LOWER AMPERAGE AD SERIES UNITS WHICH WILL MAKE THEM MORE DURABLE, STRONGER, TOUGHER. 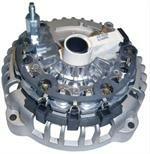 Alternator will hold up to higher Amperage Demand much Better. 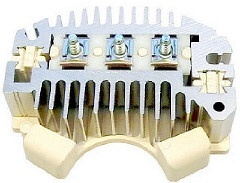 # DR3580 - Bridge Rectifier - Negative & Positive Rectifiers with Rear Housing & Brush Holder Assembly. 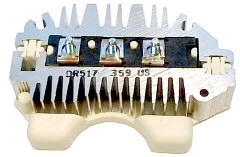 # DR3580HD - Bridge Rectifier - HEAVY DUTY Negative & Positive Rectifier with Rear Housing & Brush Holder Assembly. 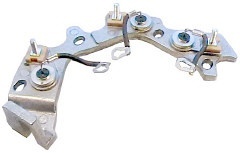 Bridge Rectifier - Heavy Duty w/ 50 amp diodes For Delco CS130D Series Alternators. Used this rectifier in 100-105 amp units to make it more reliable. Uses higher amperage rated diodes than standard units. Maximum output rating 200 amps. Bridge Rectifier with 6-70 Amp Heavy Duty Diodes w/Bi-Directional Cooling Fins, Super- Duty High Amp Version For 12Si High Amp Alternators. 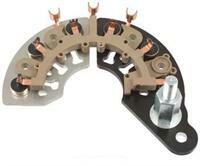 Use this rectifier in lower amperage alternator for greater reliability. 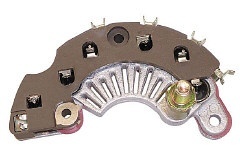 May be used in 10Si Alternator. 6-25 Ampere Diodes. For 27SI Type 100/200, 29SI, 30SI Series FOR USE ON GM Passenger Car, Heavy Truck. 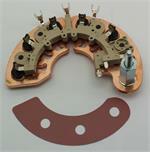 Bridge Rectifier with 6-Press Fit Avalanche Diodes Late Saw-Fin Design and heavy copper conductors. 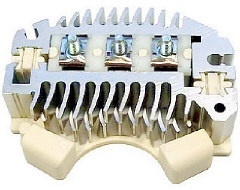 Crimp-weld diode connections. 100% New, Heavy Duty design. 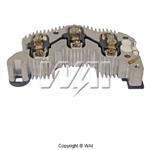 Bridge rectifier for Delco type 35Si and 36Si alternators. Used on Ford, Freightliner, Internationl, Kenworth, Mack, Peterbuilt, Sterling, Volvo, Western Star trucks and more. 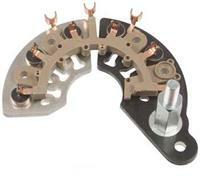 M8 Battery Terminal Bridge Rectifier for AD230 & AD237 Series Alternators.